"They’re the best chips I’ve ever had!" "I’ve never eaten tortilla chips so fresh, and the salsa is awesome! Four flavors of chips – choose four. 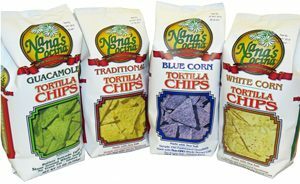 ORDER ABUELITA’S NEW NANA’S COCINA BRAND CHIPS PARTY PACK TODAY! Everyone loves chips for party gatherings, ball games, family reunions, vacations and more. With the NEW Abuelita Party Pack Online Service, we now offer our authentic Mexican chips in a variety of combinations and choices and ship them directly to your door. There’s a big difference between Abuelita’s freshly cooked chips and store-bought chips…you’ll taste the difference with every bite. Abuelita chips are cooked fresh daily and shipped directly from our facility. Nana’s Cocina fine, handcrafted, authentic Mexican recipes are so mouth-watering, they’ll be the hit of your party! And remember, “It’s not a party until Nana arrives!”. Don’t waste your time driving and waiting in line to buy your basic chips. Order online today and provide your guests with fresh, authentic chips from Abuelita.